Piech, 79, is under pressure to make way for younger family members. FRANKFURT -- Ferdinand Piech, the long-time strong man of the billionaire clan behind Volkswagen Group, is under pressure to give up his last links to the automaker, a move that could mark the inglorious end to a storied career. Members of the Porsche and Piech families are in talks over replacing the 79-year-old on the supervisory board of Porsche Automobil Holding SE, their investment vehicle that owns a majority of VW's voting shares, according to people familiar with the situation. The role is Piech's last official position after spending more than two decades pulling the strings at Volkswagen and putting it into position to become the world's largest automaker. While the clan may not be able to force Piech out, several family members want him to leave after he alleged his cousin Wolfgang Porsche and other VW supervisory board leaders might have been aware of the manufacturer's diesel-emissions cheating earlier than they stated, said the people, who asked not to be identified as the matter is private. In a sign that relations are strained within the family, Wolfgang Porsche said at the Geneva auto show that he hadn't had contact with his cousin since the fresh allegations surfaced. He added that Piech "destroyed his own lifetime achievement" by lashing out at the company. 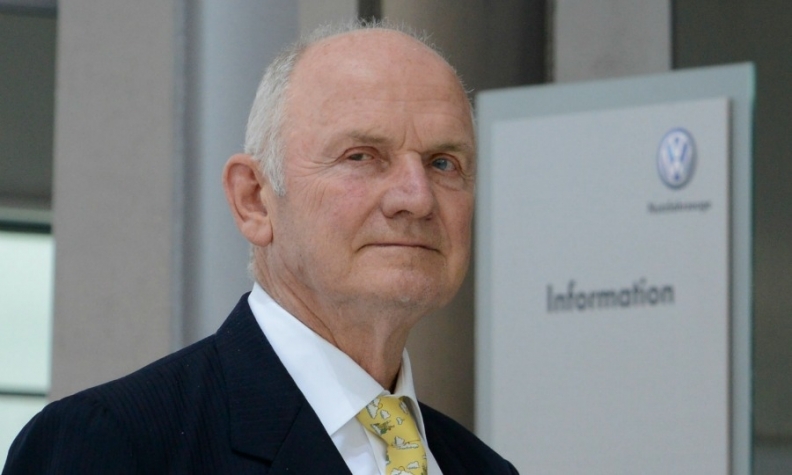 Germany's Bild am Sonntag newspaper first reported on Sunday that Piech could lose his board seat at Porsche SE at its annual meeting on May 30. A grandson of the creator of the VW Beetle and the carmaker's former chief executive officer, Piech was already sidelined after stepping down as chairman in April 2015 following a failed power struggle with former confidante Martin Winterkorn. Piech's isolation intensified after accusations last month that top Volkswagen officials knew about rigged diesel engines months before U.S. regulators exposed the deception. The allegations were rejected by investigators as "implausible." Volkswagen Chairman Hans Dieter Poetsch, who also serves as Porsche Holding's CEO and was the carmaker's long-time chief financial officer, further invalidated the claims. In Geneva last week, he told reporters that Piech's statements had been evaluated by U.S. law firm Jones Day, which is investigating the roots of the scandal, and deemed unreliable. The clan has been discussing that Piech and his cousin Hans-Peter Porsche could make way for younger members of the family at Porsche Holding's annual shareholders meeting on May 30, said the people. A decision on the candidates for the supervisory board will have to be made by mid-April, when the agenda for the annual general meeting is sent out, a spokesman for Stuttgart, Germany-based Porsche Holding said by phone, declining to elaborate further. Piech couldn't be reached for comment. Porsche Holding's supervisory board is due for a complete overhaul after labor representatives agreed to give up their posts in the company where the owner families control all the voting stock. The move will reduce the board seats to six from 12. Wolfgang Porsche, the investment company's chairman, said last week that no decision had been taken yet regarding the supervisory board posts. Piech's departure from the entity that owns 52 percent of VW's voting stock would be the final fall from grace for one of the defining figures of the modern auto industry. Piech was detail-obsessed and ruthless, orchestrating the ouster of his successor as CEO Bernd Pischetsrieder and numerous other executives. In the battle over Porsche's ill-fated takeover of Volkswagen, he turned the tables on Wolfgang Porsche and other family members as the effort began to unravel. In recent years, he sought to secure his authority at Volkswagen and had his wife Ursula, his household's former nanny, installed on the German carmaker's supervisory board. She resigned in April 2015 along with Piech after other family members backed Winterkorn in the surprise power struggle. Given the family's policy of consensual decision-making, it remains unclear if other clan members can force Piech out at Porsche Holding. The former executive is one of only a handful of family members who directly control a substantial amount of voting stock in the listed investment company. Most other holdings are fragmented between different family lines and individuals, with the notable exception of Hans-Peter's only son, Peter Daniell Porsche.